Cal Ripken Jr. 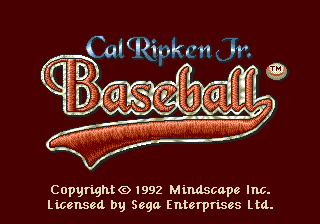 Baseball is a 1992 baseball game for the Sega Mega Drive and SNES by Mindscape. The Mega Drive version was only released in the US. The game was first announced as Mindscape Baseball, changing its name when Cal Ripken Jr. came on board to endorse it. bats, pitches, and tosses the ball to other players, and the D-pad moves. You have control of your teammates if your opponent has hit the ball. Main article: Cal Ripken Jr. Baseball/Magazine articles.